Chevron Duo beads are 10x4mm chevron-shaped two-hole Czech beads from Matubo! Step 1: Thread your needle with about 3 yards of FireLine (or start with a length that you are comfortable with and add more later). 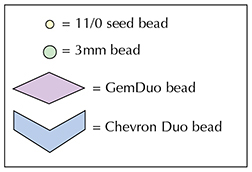 For this tutorial, the Chevron Duo beads should be positioned the way they appear in my illustrations as you add them. NOTE: You will not be making a knot until Step 3 so keep the tension tight and hold onto this tail thread for now. 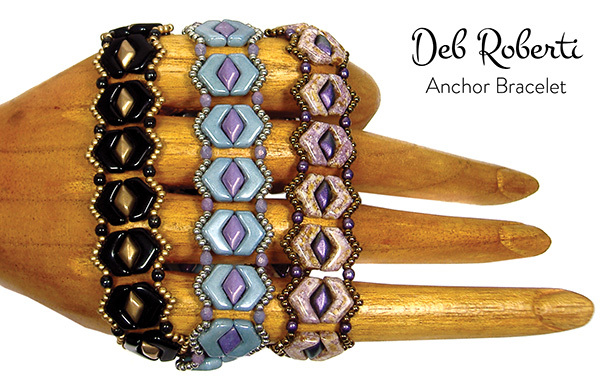 You just finished the first Anchor Bracelet motif and you will repeat Steps 5-9 to add more. Step 5: String a seed bead, a 3mm bead and a seed bead. 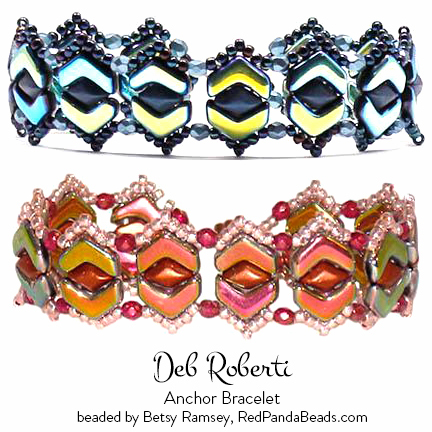 Go down through the left hole of a new Chevron Duo bead, GemDuo bead and Chevron Duo bead. You just finished the second Anchor motif. NOTE: You can go through all five seed beads instead of skipping the middle seed bead in the grouping in this step and other steps if you prefer a more rounded grouping of seed beads or if the seed beads that you used are on the small size and will not form a “peak”. 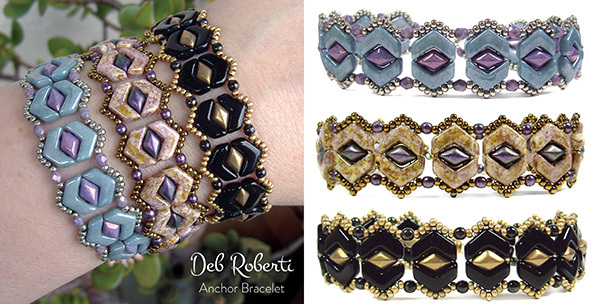 NOTE: To make your bracelet longer, just add more beads than directed in this step and the next. Weave into the bracelet, knot in several places and then cut your thread. Step 23: To attach the clasp to the other end of your bracelet, thread your needle with the tail thread from Step 1. I got my Matubo Chevron Duo beads from my friend Betsy at RedPandaBeads.com.